Having difficulty in learning fractions? If so, you have come to the right place. Each lesson consists of a math video, study tips and practice questions to help you to get going. These lessons cover the basics ideas behind fractions. 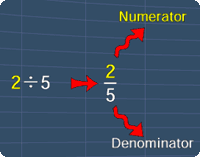 You will learn how to add, subtract, multiply and divide fractions. Some examples are provided to help you to understand better.